Bradley Cooper and Lady Gaga in A STAR IS BORN. Courtesy of Warner Brothers Pictures. It doesn’t come as much of a surprise when an actor segues into writing and directing. However, it bears further inspection when they choose a film that’s been made before – specifically three times prior in the case of multi-hyphenate Bradley Cooper’s iteration of A STAR IS BORN. Though the song remains the same, the way it’s sung and arranged puts a new spin on an enduring chart-topper. Cooper has managed to revive what worked best about the ’37, ’54 and ’76 versions, cinematically contextualize the psyche of an artist, and turn in a film that feels less like a cover tune and more like a song from the heart. And it’s a heartbreaker, custom fit for unabashed romantics and cynics alike. The soul-baring, emotionally propulsive work proves that Cooper is just as much of a dynamo behind the camera as he is in front of it. Jackson Maine (Cooper) is one of the biggest rock stars in the world – and he’s just about to hit rock bottom. He’s a messy wash of booze and pills, drowning out loneliness, sorrow and physical ailments when he meets Ally (Lady Gaga), a cabaret performer lacking self-confidence. They’re kindred spirits, adding melody and lyrics to each other’s lives within a short time. He brings out the best in her – not just by giving her confidence, but also by stoking her fighting spirit. In turn, she makes him want to be a better, sober person. However, since this is a melancholic tragedy, it’s not meant to last. When one star ascends, another falls. Cooper, Eric Roth and Will Fetters’ screenplay has quite a few narrative changes from the other iterations. Even though the core relationship is the same, it still says something new. Unlike the Streisand-Kristofferson iteration, which explores additional conflicts, this film focuses on the battle between Ally’s rising stardom and Jackson’s demons. The Drunken Spectacle sequence changes in each of the versions. Here, it’s especially difficult not to avert your eyes as we are rooting for the best for each of them. Cooper goes beyond superficial changes, tapping into the craftsmanship of his collaborators for emotional resonance. In order to put the audience into the mindset of the musical performers, Cooper and his sound design team clearly delineate stage life and off-stage life. We experience the highs and lows, going from the roar of the crowd to a serene, almost disconcerting stillness. Jackson’s tinnitus also clues the audience in to his internal perspective. Cinematographer Matthew Libatique introduces the washed-up superstar with the saturated glow of red stage lights – a subtle warning sign, as if to indicate both danger and love. Capturing the couple basking in sunlight also augments the atmosphere. Songs sung by Cooper and Gaga, written by Lukas Nelson (who coached Cooper on how to become a believable rock star) amongst others, will assuredly sell a gajillion soundtracks (mine’s on pre-order). They pack an emotional wallop and rock the senses even further. Plus, their commentary on artistic integrity is handled with humor. “I don’t want to lose the part of me that’s talented,” Ally says to her pushy manager. Renewed vigor is also found within the infinitely texturized performances of the entire ensemble. All bring a tangible authenticity to their roles, each having wrestled with the limelight themselves – Andrew Dice Clay, who plays Ally’s father Lorenzo, and Dave Chappelle, who plays Jackson’s best friend Noodles, best illustrating this point. It’s a quality that informs and grounds the narrative, but never overwhelms the character-driven dramatics. There’s an inherent lived-in feeling to the film that’s birthed out of those real-life experiences. Lady Gaga and Andrew Dice Clay in A STAR IS BORN. Courtesy of Warner Brothers Pictures. Familial relationships steal a bigger swath of the spotlight in this new version. While the primary focus is on the tumultuous romance between Jackson and Ally, their family members – blood and surrogate – also are given room to breathe. It shows the foundational layers the couple brings to the table when they’re together. 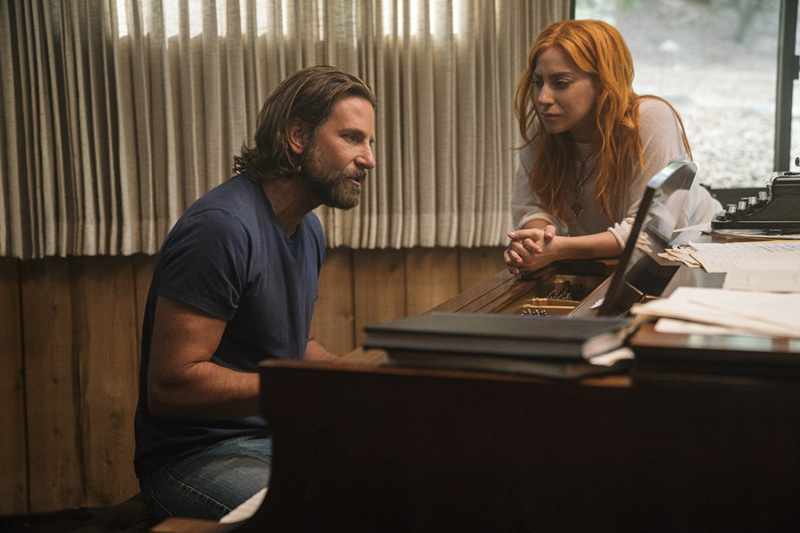 The father-daughter relationship between Lorenzo and Ally is not only genuinely affecting (and maybe based in part on Gaga’s personal dynamic with her own father), but also shows how Ally is able to relate to someone with an addiction. The Southern-drawl baritone that Cooper adopts for Jackson echoes the signature voice of Sam Elliott, who plays older brother Bobby. It also reinforces the emotional punch of the dialogue – specifically one line in the third act. Cooper’s a deft performer, coaxing out the truth of the scenarios. His chemistry with Gaga is phenomenal. Her performance is effortless, vibrant, transformative and passionate. Her vulnerability and fragility shine just as bright as her strength. I stop short of calling her a revelation, as anyone who’s seen her documentary GAGA: FIVE FOOT TWO knows she’s an incredible talent who defies all limits. Despite playing it a bit safe, following traditional guidelines when it’s clear they could stretch a tad more, the filmmakers push boundaries in the right ways for mass audience appeal. There’s a haunting quality to the film Cooper and company have meticulously crafted. They’ve found all the right strings to pluck in our hearts, striking strong emotional chords. A STAR IS BORN opens on October 5.